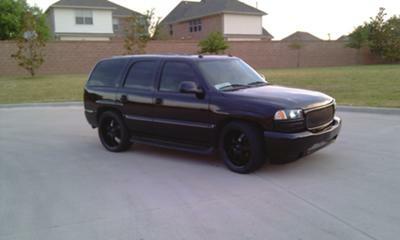 I started off with a Black 05 Yukon SLT Autoride. I wasnt sure how far i wanted to go with this project but once i startd i couldnt stop and im still going with new things. 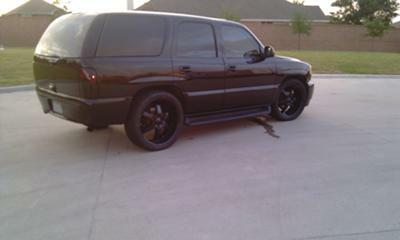 Mcgaughys 2/3 Drop "Spindles and Springs"
Id like to replace the engine with a corvette one or the escalade 6.3, The new bumper, Shave all the doors, Bag the rear and lower the front a inch or 2, Street Scene side skirts and thats all i can really think of at this point. The most difficult of all this has been $$$ and wanting to do something myself but not knowing how to or lack of tools. 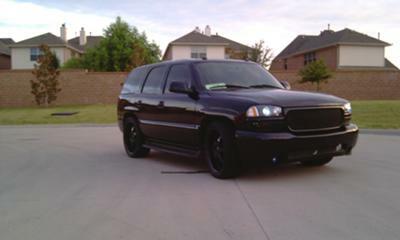 My inspiration would have to be i love GM trucks and ive always wanted a Yukon to customize and i love the color black. Also i wanted to bring the old school hotrods with te new school customs. 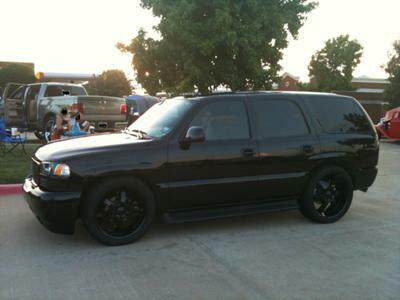 Thats why i have the staggered look and no one has a staggered SUV with 22's and 24's. I wanted something People havent seen but also people can enjoy looking at and see the new and old brought together. Id like to one day take best of show at one or more of the car shows i go to on the weekends but im very pleased with enjoying car shows and people enjoying my vision. What bumper is that man I got a 2001 yukon slt and I want to get rid of the chrome bumper and have a bumper like the one I have.